EVERETT — New high school district lines are being drawn and 300 concerned residents showed up to Gateway Middle School last week upset their student might fall on the “wrong” side. About 460 students stand to be relocated from Jackson High School to Cascade. A similar number would move from Cascade to Everett High. The redistricting will take effect in fall 2020 and exempt seniors. 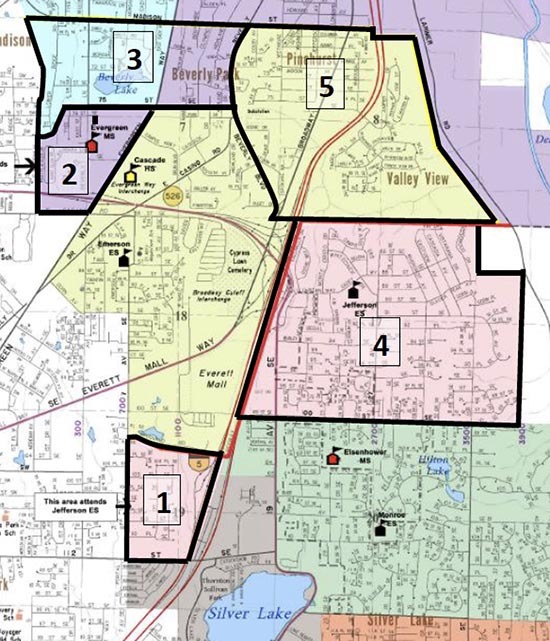 At the Feb. 6 meeting, staffers revealed two maps. Each displayed numbered sections that showed how likely students living in those sections were to be relocated north. The committee of 30 people drafting the lines was divided into five groups. If a section had No. 5 in it, this indicated all the groups thought the move was beneficial. A one or two meant only one or two of the five groups was in favor of relocating those students, and a move would be unlikely. Project facilitator Jim Dugan faced the contentious crowd to update them on the inevitable migration. The boundary committee’s recommendation is due to the district March 31. A final decision is slated for June following a public hearing process. “You can’t make a basket if you don’t shoot,” Dugan said, using a basketball metaphor to encouraging people to voice their concerns at the meeting or online. Many angry parents touted Jackson’s reputation as the best high school in the city and vented about what they and their children might lose if relocated. value declines if they shift from Jackson to Cascade. They said they wouldn’t likely have left Texas if they knew. Many parents shared their concerns. as her middle school seemed sunk. Father Abhishek Kumar was concerned about the quality of education he perceived at Cascade and that the neighborhood was less safe. “If you bussed my kids to a better school 10 miles away,” I wouldn’t be concerned, he said, but as it was he feared his child losing out on tech programs and safety at Jackson. The recommended changes are being made with a set of nine guiding principles in mind, Dugan said. They include reducing the time students spend on buses, keeping cohorts of children together and avoiding inequities and ensuring safe routes to schools. The district is considering another bond attempt after a $330 million bond failed last year, but even if voters were swayed, a new school would be four years out. And if a bond measure did pass, parents might find themselves revisiting the boundary revision process. How to read these maps: The higher the number, the more likely your student might be sent to a different high school starting in 2020 under a boundary line change, excluding seniors. These are not final recommendations, but suggestions that will be decided next month.